alone trying on your world. the steam rises, hangs and runs down the walls. like the colour of the ocean in a cartoon, but deeper. the old black and white picture of a horse and cart. a woman crying, pots and pans colliding, someone shouting. Hello is there anybody there? I start to sing when I am sure no-one is listening. while my ears buzzed in confused resonance. through the dust and cobwebs of my soul. Biography: Hello, my name is Tracy Higgins, thank you for reading my poems, I hope you like them, here is my brief biog... I have lived in Canterbury since 2002 and really like it here. I was born in Scotland but moved to Yorkshire with my family in my early teens so have a mixed up hybrid accent, which says a lot about me. I have always had a love of writing and particularly enjoy reading and writing poetry. In my day job I work part-time as a Statistician. I also love films, music, dancing, walking in the woods and spending time with my family and friends. Each drawer slides out in silence. First the gradations of white – snow, ivory, pearl – then the browns, greens, shades of fleck, all arranged on sheepskin, named, dated, and geographically placed in a fading scrawl. Clutches of plover, ptarmigan, shrike, and here, a golden eagle’s non-identical twins – feather-weights in my hands, no albumen or yolk, just cradles of air with tiny man-made holes. While around the room a weight of books: engraved and coloured plates, breeding times, conception, birth, flight. The histories of lives they never lived. Biography: Lynne Rees was born and grew up in South Wales. She worked as a currency dealer in the Channel Islands and moved to Kent in 1985 where she ran her own second-hand and antiquarian bookshop for 12 years. She's the author of a novel, The Oven House (2004), a collection of poetry, Learning How to Fall (2005), and co-author of Messages (2006), a volume of experimental short prose. She founded and directs AppleHouse Poetry, an independent project supporting poets in the South East of England through a programme of workshops and masterclasses. to all we had saved. and small faces look up at me. I live with a silent man, wait on his words. slices the silence, lingers in my hearing. In the dark I feel his body tense. conversations crackle behind the headboard. muted roars from the box room. Somehow, we ended up apologising. snarling at anything in denim. filmed on a back-lot in Hollywood. Only God travels the universe. Biography: Fran Addison is currently a part-time student of English Literature and Creative Writing at University of Kent. Her work has appeared in Nightrain, Logos, Folkestone Creative and the anthology Statement for the Prosecution. She lives quietly in Folkestone under the guise of a middle-aged administrator and is partial to a gin and tonic. a pyramid. A golden triangle. to hands in the golden rectangle. plasticine models of a Spitfire or the Titanic. eat gnocchi on their eighth birthdays? one wasteland is like any other. and the shells of deer and rodents. Biography: Luigi Marchini was brought up in London where he spent many a happy maths and physics lesson at the Natinal Film Theatre. and try to see beyond that last night. a priest’s head rolling down to ditches. and one too many in the company of friends. where I appear as a stranger. sweep around curves and flow alongside rivers. around me and draw me into their deep crevices. crisp against a perfect sky. you have to leave the past behind. as climbing, the engine strains and sighs. Biography: Anne Kenny stumbled into witing poetry whist living in Melbourne for a year. Her poems have been published in a range of journals including BlueDog: Australian Poetry and Equinox. to the girl with the pierced tongue and pointed shoes. absorbed more than your share of spilled red wine. didn’t suffer too much from passive smoking. I know your body as well as my own. the click and gurgle of waking pipes on winter mornings. I could have looked after you better. tassled lanterns from my parents’ tree. tinfoil crackers our daughter made at nursery. staring at cracks we thought we’d forgotten. Biography: Vicky Wilson fell in love with writing poetry while doing a Certificate in Creative Writing module at the University of Kent taught by Lynne Rees. Her poems have been accepted for publication in Equinox, Acumen, The Interpreter's House, Logos, Night Train 2 and the anthology My Mother Threw Knives (Second Light Publications, 2006). In 2005, with Bob Collman, she compiled the anti-war anthology Statement for the Prosecution, which was launched at the Orange Street club and raised over £250 for Amnesty International and CND. Favourite poetry sites: www.poems.com, which posts a different poem each day - a perfect bite-sized reminder that poetry is still there when the rest of life threatens to take over - and www.poetrypf.co.uk, on which you will soon be able to read more of her work. and I knew I was sunk. this would be a No, No. for the fool I would become. in the sea of noise. from where I watched transfixed. Born: Hastings. Studied Fine Art in England and America. Work: various, including caretaker, set-decorator, bar-man, and currently teacher. Interests: Music, gigs, films, food, art and of course, writing. Current Studies: Creative Writing and Literature at U.K.C. 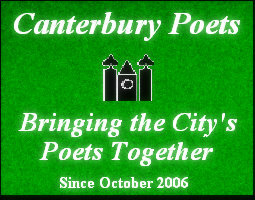 I have sent three poems to canterburypoets.blogspot to support one of its founders, my mate Chris, a fellow member of the SaveAs writing group and joint member of the editorial team of Logos writing magazine. The three poems aren't meant to be showing off, but rather just as a few examples to say hi to anyone out there who's interested in writing. Blank Page is alternatively named At the Sound of the Bell, and is about struggling to be anything other than ham-fisted and obvious with my words. I've included The Way It Is (alternatively named Haiku Abuse) as an example of how, although we are frequently told that we need to study respected writers seriously to know our place in the writing time-line and to improve our own work, once we have looked at form and appropriateness we can use it anyway we like, to our own ends. For me, the haiku idea doesn't have to lead to a clean, shiny, mystical epiphany when we live in England, 2006. Lastly, In God We Trust is included as an example of how I write quickly from the heart and gut when something like the shite world of politicians and war pisses me off. If anyone reads any of these poems and appreciates them, then I'll be pleased. And if anyone wants to send in some of their own to accompany me then I'll be chuffed. All of the Poets are listed below. Click on any name to see their poems. To see the list again, click the button marked "refresh the poets list".